Linguistic map of Belgium. Officially Francophone areas in red. Belgian French (French: français de Belgique) is the variety of French spoken mainly among the French Community of Belgium, alongside related Oïl languages of the region such as Walloon, Picard, Champenois and Lorrain (Gaumais). The French language spoken in Belgium differs very little from that of France or Switzerland. It is characterized by the use of some terms that are considered archaic in France, as well as loanwords from languages such as Walloon, Picard and Dutch. French is one of the three official languages of Belgium alongside Dutch and German. It is spoken natively by around 39% of the population, primarily in the southern region of Wallonia and the Brussels-Capital Region. While a number of Oïl languages have traditionally been spoken in different areas of Wallonia, French emerged as the regional language of literature in the 13th century. This was a result of heavy French cultural influence on the region over the past few centuries. Owing to the diversity of local languages, the French language in Wallonia was influenced by them, with words from Walloon, Picard, Champenois and Lorrain making their way into the local variant. 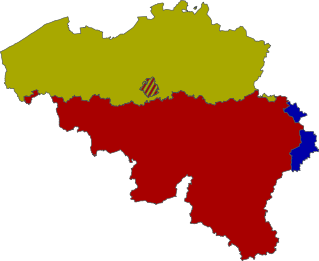 Until the 20th century, Walloon was the majority language of Wallonia, and most speakers were bilingual in both French and Walloon. While the French spoken in Wallonia was influenced by local languages, the variant spoken in Brussels was influenced by Dutch, specifically the local Brabantian dialect. The city, geographically located within the Flanders region, was originally just a Dutch-speaking city. However, a gradual Frenchification took place beginning in the 19th century and intensifying towards the end of that and continuing throughout the next (20th) century. Today, many Dutch idioms or expressions have been translated into French and are used as such in the Brussels area. There are a few consistent phonological differences between the French spoken in France and Belgian French, but usually no more than the differences between regional dialects within France (or the ones that exist between English-Canadian speakers of Toronto and Vancouver, for instance), which might be even non-existent. Regional accents however, can vary from city to city (e.g. the Liège accent), but on the whole they may vary more according to one's social class and education. While stronger accents have been more typical of working-class people, they have become much less pronounced since World War I and the widespread use of television, which has helped to standardize accents and the types of words speakers will use. Within the French community of Belgium, standard French pronunciation is taught to students. The following differences vary among speakers, depending on their level of education, age, and the region they come from. Lack of the approximant /ɥ/: The combination /ɥi/ is replaced by /wi/, and in other situations /ɥ/ becomes a full vowel /y/. Thus for most Belgian speakers, the words enfuir (to run away) and enfouir (to bury) are homophones. The nasal vowels are pronounced like in French of France. /ɑ̃/ → [ɒ̃], /ɛ̃/ → [æ̃], /ɔ̃/ → [õ]. The distinction between the nasal vowels /ɛ̃/ and /œ̃/ is upheld in Belgian French, whereas in many regions of France, these two sounds have merged. Thus, in Parisian French brin (stalk) and brun (brown) are pronounced the same way, but not in Belgian French. The distinction between the vowels /ɛ/ and /ɛː/ is upheld, whereas in France, these two sounds have merged. The words mettre (put) and maître (master) are pronounced differently in Belgian French. The distinction between the vowels /o/ and /ɔ/ is upheld in final open syllables, the words peau (skin) and pot (jar) are pronounced differently; they are pronounced the same in French of France and in Quebec French. A stronger distinction exists between long and short vowels. While long vowels are constrained to closed syllables in French of France, Belgian French also has them in absolute final position: ⟨ée⟩, ⟨aie⟩ [eː]#, ⟨ue⟩ [yː]#, ⟨ie⟩ [iː]#, ⟨oue⟩ [uː]# and ⟨eue⟩ [øː]#. As a result, almost all feminine adjectives are phonetically distinct from their masculine counterparts for Belgians. The marginal phoneme /ɑ/ is most of the time rendered as a lengthened version of /a/: [aː]. The letter "w" is almost always pronounced /w/, the same as in English, which also approximates Flemish "w". In France, it is often pronounced /v/ as in German. For example, the word wagon (train car) is pronounced /vaɡɔ̃/ in Standard French, but /waɡɔ̃/ in Belgian French. For some speakers, final stops are devoiced: "d" becomes "t", "b" becomes "p", and "g" becomes "k". Combined with the dropping of consonants in final consonant clusters, this leads to pronunciations like [ɡʁɒ̃ːt] instead of [ɡʁɒ̃ːd] ("grande") and [taːp] instead of /tabl/ ("table"). Certain accents, such as certain urban accents (notably those of Brussels and Liège), as well as the accents of older speakers, and particularly less educated speakers, display greater deviation from Standard French pronunciation. For example, in the dialect spoken in and around Liège, particularly among older speakers, the letter "h" is pronounced in certain positions, whereas it is never pronounced in Standard French. That dialect is also known for its slow, slightly singing intonation, a feature that is even stronger farther east, in the Verviers area. Words unique to Belgian French are called "Belgicisms" (French: belgicismes). Incidentally this term is also used to refer to Dutch words used in Belgium but not in the Netherlands. In general, the upper-middle-class or well-educated Belgian Francophones understand the meaning and use of words in standard French, and may also use standard French when speaking with a non-Belgian who speaks in standard French (as hinted by their accent). Overall, the lexical differences between standard French and Belgian French are minor (akin to the differences that might exist between two well-educated American English speakers living in different states of the United States, a well-educated Canadian English speaker and a well-educated British English speaker, for instance). The use of septante for "seventy" and nonante for "ninety", in contrast to Standard French soixante-dix (literally "sixty-ten") and quatre-vingt-dix ("four-twenty-ten"). These words are also used in Swiss French. Unlike the Swiss, however, Belgians never use huitante in the place of quatre-vingts ("four twenties"). Although considered a Belgicism/Helveticism, septante and nonante were common in France as well until around the 16th century, when the composite forms began to dominate. The words for meals vary, as described in the table below. The usage in Belgian, Swiss, and Canadian French accords with the etymology—déjeuner comes from a verb meaning "to break the fast". In Standard French, however, breakfast is rendered by petit déjeuner. Souper is instead used in France to refer to a meal taken around midnight, after going to the opera, the theatre, or a similar night-time event. barakî (similar to the word chav in British English). Crolle ("curl") reflects the Brabantic pronunciation of the Dutch word krul. S'il vous plaît is used to mean "here" (when handing someone something) as well as "please", whereas in France the meaning is limited to "please" - and "voilà" is used for "here". This is comparable to the use of alstublieft in Dutch. Sur (from Dutch zuur) means "sour", while in France, the word acide is used. Dringuelle, standard French "pourboire", "tip", from the Dutch word drinkgeld. Although this is less commonly used in Brussels. Kot (student room in a dormitory) from Belgian Dutch "kot". Ring (ring road) from Dutch "ring". In Standard French: "une ceinture périphérique". Savoir (to know) is often used in the place of pouvoir (to be able [to]). This was quite common, however, in older forms of French. Blinquer (to shine), instead of briller, has a German origin, through Walloon. Bourgmestre (mayor), instead of maire. Tu viens avec ?, standard French "Tu m'accompagnes ? ", literally "Are you coming with?" (meaning "Are you coming with me? "), is a calque of Dutch Kom je mee? Ça tire ici (mainly said in Brussels), compared to standard French "Il y a un courant d'air", "there is a draught", is a calque of the Belgian Dutch Het trekt hier. Phrases such as pour + V ; ex : "Passe-moi un bic, pour écrire", standard French "Donne-moi un stylo, afin que je puisse écrire", "Give me a pen, so that I can write / for me to write", is a grammatical structure found in Dutch ("om te +V"). "Qu'est-ce que c'est que ça pour un animal ? ", standard French "Qu'est-ce que c'est comme animal ?" / "Quelle sorte d'animal c'est ? ", English "What kind of animal is this?" (literally "What is that for an animal? "), Dutch "Wat is dat voor een dier?" Usage of une fois ("once") in mid-sentence, especially in Brussels, is a direct translation from the Dutch "eens". French people who want to imitate the Belgian accent often use a lot of "une fois" at the end of the sentences, which is often wrong. Example: "Viens une fois ici" - literally from the Dutch : "Kom eens hier" ("Come once here") . "Une fois" cannot really be translated in other languages; its function is to soften the meaning of the sentence. The English equivalent would be "Could you come here?" or "Why don't you come here?". Jouer poker, should be "Jouer au poker" in standard French. Inspired by the Dutch Poker spelen. ↑ von Wartburg, Walther (1983). Französisches Etymologisches Wörterbuch. Bonn, Basel. Look up Category:Belgian French in Wiktionary, the free dictionary. (French) Dictionnaire des belgicismes: a dictionary of Belgicisms.